Sean Waugh, a 2005 High School graduate of Arkansas City, was a 2005-06 OU Club of Wichita scholarship recipient. Sean is a Meteorology student at the University of Oklahoma and has so far obtained his Bachelors and Masters Degrees. He plans to receive his Ph.D. in Meteorology in May of 2016. As a junior at OU, he received the Outstanding Junior Award in the College of Atmospheric and Geographic Sciences for 2007-2008. This award is based on GPA, the number of hours completed and participation in service activities on the OU campus. Sean has been actively involved with the Weather Festival at the National Weather Center and organizes weather balloon launches at the event each year. He was the recipient of the Lloyd Noble Trailblazer Scholarship Award which is granted to the outstanding junior in college. During his junior year, he was selected as a Hollings Scholarship recipient, a prestigious national recognition. This scholarship included a paid internship at a NOAA office of his choosing, and gave Sean access into the National Severe Storms Lab (NSSL) and started his research career. 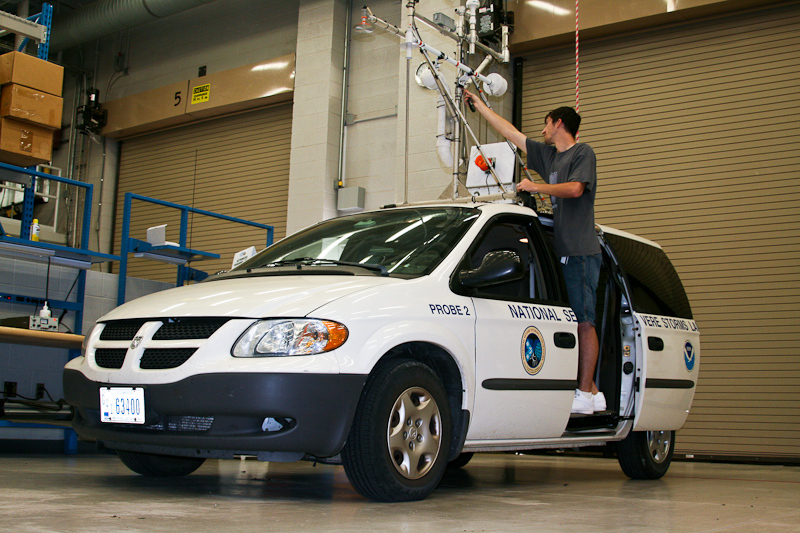 Since becoming involved with NSSL, he has assisted in many different research projects, including traveling to Galveston, Tx to test new mobile radar equipment during Hurricane Ike. Sean Waugh working with youngsters at the National Weather Festival. As a senior at OU, he was an integral part of tornado research project called VORTEX2 (Verification of the Origins of Rotation in Tornadoes Experiment). He designed and built vehicles for the project and drove one of the lead vehicles as the convoy of 100 scientists and 40 specialized vehicles traveled 11 states for over a month, during the 2009 and 2010 severe weather season. Since then, his work at the lab has continued to grow and he has become the foremost point of contact when designing instrumentation for field campaigns. Sean currently works for the University of Oklahoma in the National Weather Center in Norman and the National Severe Storms Lab, while working on finishing up his Ph.D. studies.